GTCP (formerly the Social Justice Committee) promotes student learning, equity, and empowerment through quality teaching and active community engagement. If you have something going on in the community that you would like GTCP to help with, please fill out the form here. Send a GTA Member on the Ride of His Life! 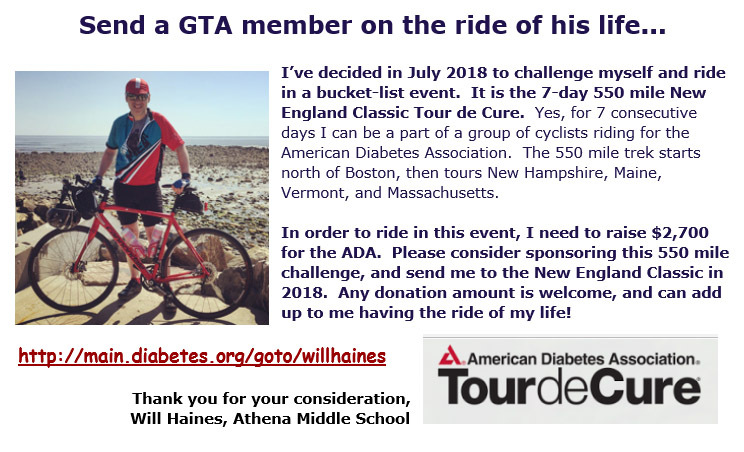 Please help GTA Member Will Haines as he raises money for the American Diabetes Association. Good luck, Will! Information on the GTA Social Justice Committee’s 2017 Stuff-a-Bus Food Drive can be found here. Competition for the Food Bowl is going to be tough this year! The Greece Teachers Association is matching $25 contributions to New York State 529 College Savings Program for all GCSD Kindergarten students. If you have one already, just email the GTA at greeceteachers@gmail.com with your Ugift code or create a new savings account using this link. There you’ll find all you need- including FAQs and videos to learn about and help set it up. There is never a better time to start saving than now! Please contact us with any questions.